The expense of caring for veterans of the Iraq and Afghanistan wars is an unfunded budget liability for U.S. taxpayers that in years to come will rival the cost of entitlement programs such as Social Security and Medicare, lawmakers were told Sept. 30. The House Veterans' Affairs Committee heard new estimates of the cost of lifetime medical care and benefits for returning troops disabled by their service — a total of more than $1.3 trillion. "It's somewhere between Medicare and Social Security in terms of its potential impact" on the budget, said Rep. Bob Filner, California Democrat and committee chairman. "This is another entitlement that we have committed ourselves to that is going to break the bank unless we deal with these issues as soon as possible," he told reporters. The committee heard testimony from two economists, Nobel laureate Joseph Stiglitz and Linda Bilmes of Harvard University, and Mr. Filner unveiled a plan to establish a trust fund to build up cash reserves to help meet the future costs of veterans' care. Ms. Bilmes said Sept. 29 that, with more than a half-million claims for disability benefits already filed by veterans of Iraq and Afghanistan — and close to 600,000 being treated in Veterans Affairs medical facilities — the cost of lifetime care and benefits over the next 40 years would be between $589 billion and $934 billion, "depending on the duration and the intensity of the wars." The broad range of the figures, she said, reflects uncertainty about the numbers of troops who would be deployed in years to come. The Congressional Budget Office estimates, which she and Mr. Stiglitz used, provide for the deployment of 30,000 to 65,000 U.S. troops in Iraq and Afghanistan until 2020. Based on the historic experience of Vietnam and the Persian Gulf War, where increasing numbers of veterans have sought treatment or benefits for service-related ailments as years pass, "these costs are going to mount significantly over time," said Donald Overton, executive director of advocacy group Veterans of Modern Warfare. He said the cost of disability benefits from the Gulf War, which lasted six weeks in 1991, is $4.5 billion a year and rising — and is unlikely to peak for many years. The peak years of the cost of benefits for World War II veterans, for instance, were in the 1980s. 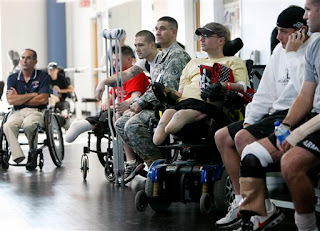 In broader terms, Ms. Bilmes said, 2009 Treasury statements make allowance for an overall liability of $1.3 trillion for disability and burial benefits for all veterans — a sum that does not include the costs of medical care. That figure "is quite possibility an underestimate," added Mr. Stiglitz. He noted that the higher survival rates of wounded warriors and the larger proportion of veterans diagnosed with mental health disorders in the current conflicts likely would make the costs higher than in previous wars. The Veterans Affairs press office did not return phone calls and an e-mail requesting comment. Whatever the exact cost turns out to be, "there's no mechanism just now for meeting that liability," said Ms. Bilmes. Mr. Filner said he is working on legislation that he hopes to introduce early next year to create a trust fund in which cash would be allowed to accrue annually to meet growing future costs. He said he is concerned that funding for veterans' care would decline as the memory of the wars fade over time. "The cost … keeps going up even when the war is way over, so you need to keep building up a trust fund to deal with those issues," he said.